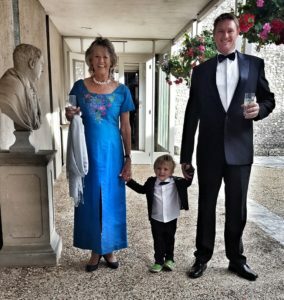 On the 28th of June 2018 we held a fundraiser for our hub and conservation project in the Maasai Mara in Kenya at the Goodwood House in the United Kingdom. We managed to raise over $90,000. We chose this venue as we felt it is in a location where we would be able to draw some big donors and we had a connection in that the son of the Duke of Richmond had recently spent time volunteering with us within the Enonkishu Conservancy. The Duke of Richmond very kindly donated the venue for the evening. We also managed to secure sponsorship for the wine, the welcome drinks and the entertainment. We sold just over 150 tickets at £200 pounds each, mainly through an email campaign. We found a partner in the UK, Wild Philanthropy, a charity so that any donations would be tax efficient and they could help us in running the accounts, collecting ticket sales and auction bids. We went on a campaign to secure some amazing auction prizes, including paintings by International Wildlife Artist of the Year Martin Aveling and the late David Shepherd as well as a safari at Angama in “Africa’s Best lodge 2017”, a Journey by Design safari including Ol Malo and House in the Wild. We also offered a helicopter trip in the Mara Elephant Project helicopter to monitor elephant movements and help mitigate human/wildlife conflict as well as the opportunity to volunteer for 2 months at the Mara Training Centre and Enonkishu. Conservation is an expensive business and since we started, we have been actively raising funds to get our projects off the ground. 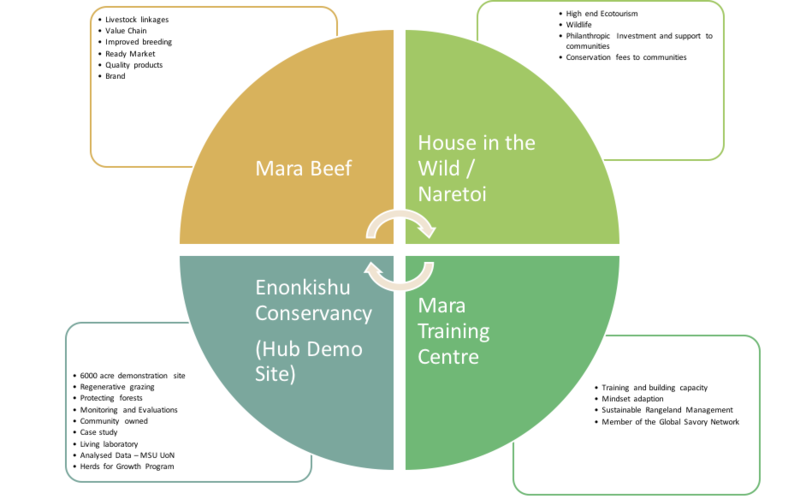 We have a model of conservation that includes creating sustainable enterprises that will fund the conservation area (our hub demo site). Since the beginning of the year, we have been under immense pressure to secure the demo site through Enonkishu leases as our AECF grant (which had paid for 3 years of land rent 2014 – 2017) came to an end at the close of 2017. 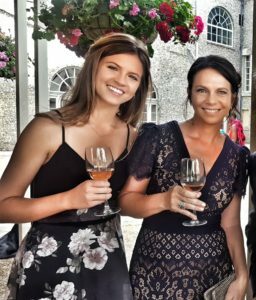 The funds raised from this Goodwood event will significantly reduce this pressure. 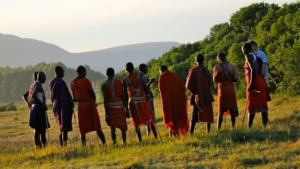 The funding raised equates to roughly 2/3 of the annual lease payment to Enonkishu’s conservancy members. These contributions, along with the increased conservancy fees from our ecotourism products (Naretoi, House in the Wild and the Mara Training Centre) will finally secure Enonkishu and make it less donor / grant dependent. House in the Wild provided the accommodation for the team that visited England through a “house swap” with Baldon House in Oxfordshire, having a peaceful place to stay in the midst of event planning and meet-ups with donors. The evening at Goodwood began with a tour of the artwork and intricacies of the house. 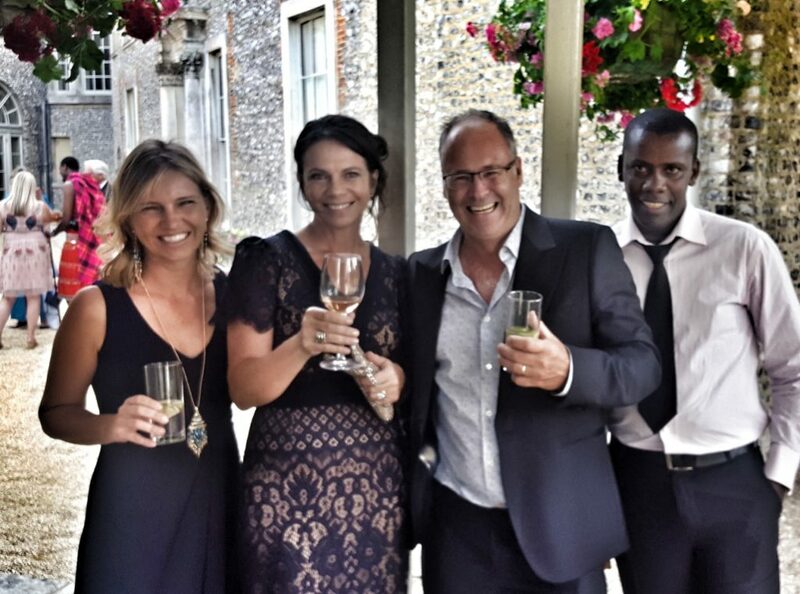 Guests were welcomed with delicious cocktails with an “Out of Africa” theme of “Dawas” and Gin and tonics with Tarquin’s Dry Gin (donated by Hamish Stoddart). 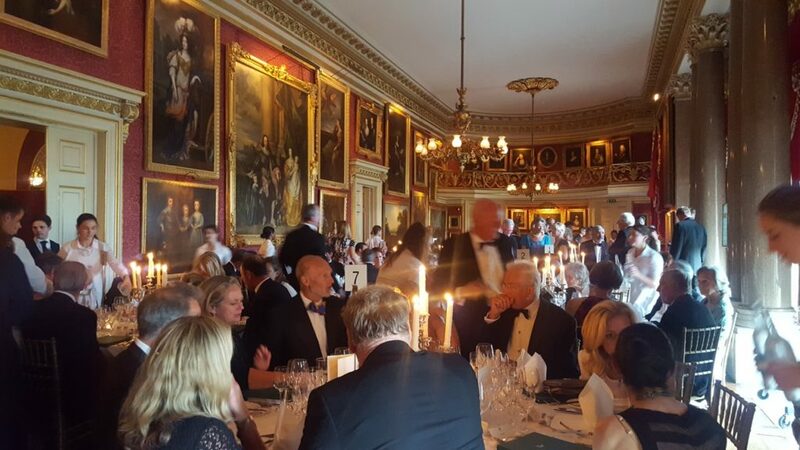 Dinner was served in the magnificent Goodwood House ballroom. Tarquin gave a heartfelt note of thanks to everyone who made the event possible. Dillan Sievwright, one of our recent volunteers and son of our Naretoi partners Brett and Sue Sievwright created a fantastic video which set the scene for the evening as it played on the huge screens set up for guests to watch. 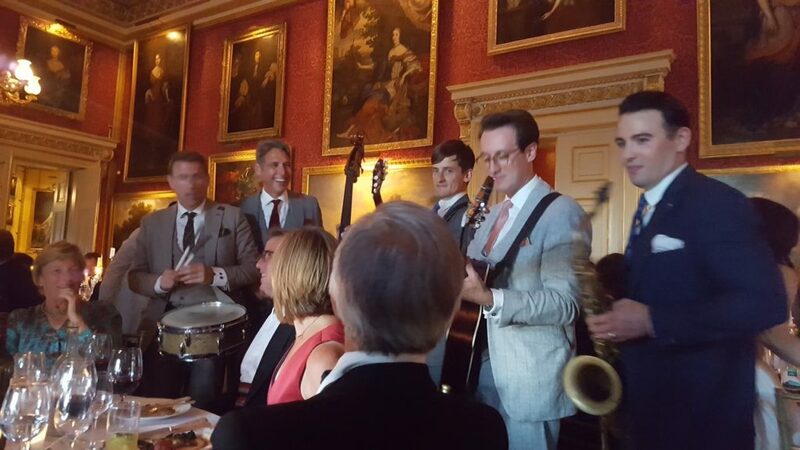 The London Essentials provided the entertainment for the evening in exchange for a safari at House in the Wild. They were a huge hit, travelling to different tables to serenade guests and involve everyone in the joyous atmosphere. 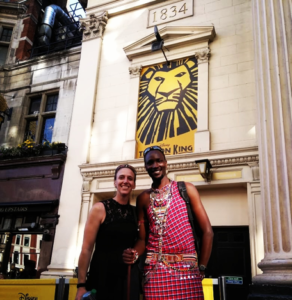 Martha and Bob Falkenberg, a family who have invested in a home on Naretoi, helped to purchase a plane ticket for Moses Nampaso, our Maasai guide and community representative, so we were able to bring him with us to London. Having his input on the evening as the keynote speaker was essential to the success of it all. 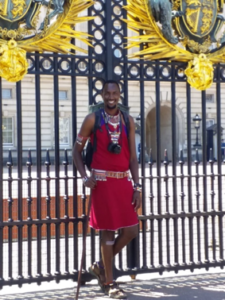 This was Moses’s first trip overseas and he proudly wore his traditional Maasai outfit for the majority of his stay. 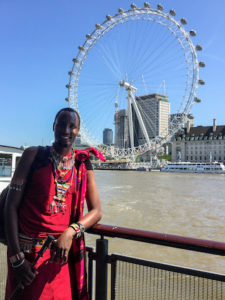 He regaled commuters on the tube in London with tales of tracking lions and elephants and had people wanting selfies with him as he toured Buckingham Palace and the London Eye. he Mara ecosystem and all it includes. He started his speech saying he felt he was dreaming and then moved on to talk about the challenges his community are facing and how Enonkishu brings hope and inspiration for many. He finished it by saying “my heart is filled with happiness, so I will sing you a traditional Maasai song”. This resulted in a well-deserved standing ovation! The auction followed on from this, facilitated by Brian Perry as the lead auctioneer, with support from Graham Shaw and John Gower. The mood was so generous that two of the auction items doubled up! Following the auction, The Earl of March and Kinrara took the microphone and raised 12 pledges each tosponsor a ranger for a year. Rebekah Karimi, our Enonkishu Conservancy manager joined us for the trip and has been vital to the success of the conservancy. Rebekah has a background as a conservation biologist and is collecting data on the rangelands of Enonkishu, which is vital to see trends, improvements, for funding and in making us accountable. Rebekah manages a team of rangers, oversees the grazing plan and handles all aspects of the management of the conservancy! 1. 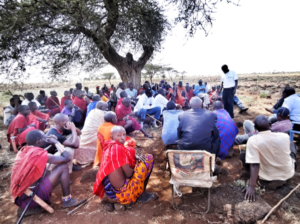 To secure the Enonkishu Conservancy, prevent biodiversity loss and human wildlife conflict, which happens when communities clear wildlife grazing habitat for maize farming. Whilst we develop the model and grow the revenue streams to a scale that can finance the conservancy operations, we continue to depend a bit on donor funding to cover leasing the land from the local communities. Following a successful grant from the Africa Enterprise Challenge Fund, that covered our first 3 years of land leases for Enonkishu Conservancy, we now are looking for funding to make up the leases which is not yet covered by our growing enterprises. 2. To train community members in Holistic Management. The future of East Africa’s rangelands and the livelihoods of the stakeholders who depend on them, and the wildlife habitats are uncertain. Due to changing climate and lifestyles and a rapidly growing population, these systems are facing increasing challenges. We intend to roll out our proven model to train community members in Holistic Management with some of the funding raised.